Last Week In The NFL. . . Conduct and Character. . . .
There’s no need for me to retell the story that saturated the media and our attention last week. Just mention the name “Ray Rice” and most every one knows who and what you’re talking about. While the NFL has been dragged into a “he knew” and “he didn’t know” see-saw of speculation that won’t be dying anytime soon, there are variety of other angles and threads to this story that are playing out. There are so many, in fact, that I can’t keep them all straight. Nor do I have the confidence to speculate with any amount of depth or insight regarding all those angles and threads. But there is one cultural reality present in this story that keeps rearing its ugly head in my head, and I think it’s worth looking at a bit more closely. . .
Last Thursday night, Rice’s former teammates on the Baltimore Ravens welcomed the Pittsburgh Steelers to M&T Bank Stadium. Fans from both teams flooded into the stands while dressed in support of their favorite team and favorite players. This is the way we cheer now. We dress up, which of course has created a whole business empire of logo-sporting attire. That empire continues to grow, by the way, especially at the college level where the playing field has turned into a kind of fashion runway where new uniform variations appear just about every week. What continues to be most-stunning to me is the fact that enough women wore Ray Rice jerseys to the game that several news stories appeared which first documented this reality, and then offered quotes from these women justifying and defending their continued attachment to their Ray Rice jerseys. . . and seemingly, Ray Rice the football player, himself. Just to set the context. . . like me, they all knew the story and they had all seen the video of Rice knocking his wife out cold in an elevator. Like me, they’ve all been privy to the follow-up conversations on domestic violence. Unlike me, they are all women. . . which in my mind would indicate that they might even be more prone to condemn Rice and his actions than any man might be. All this leads me to a cultural reality that is no respecter of persons, age, or gender. It’s our willingness to separate conduct from character. . . to pull the very indicator of character away from the very thing that it’s meant to indicate. We are now living in a day and age where a person can commit a heinous act, and then still be esteemed and even idolized without question. 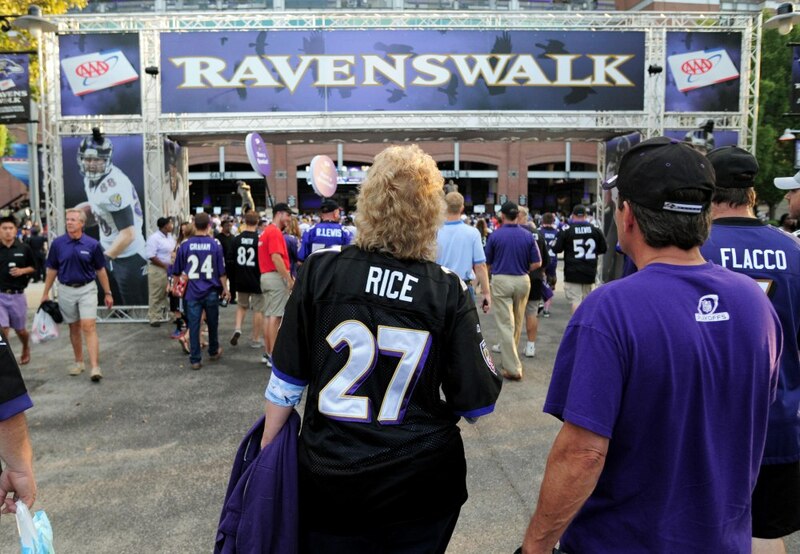 Sure, Ray Rice’s wife has even come to his defense. But we have to remember that this is not that unusual in a case of domestic violence. Victims often defend or write off (for a variety of reasons) the continued bad behavior of their victimizers. But shouldn’t those who stand objectively outside of the personal relationship and situation have a more clear or better perspective? Could it be that even though these women don’t really know Ray Rice, their relationship with him as a celebrity leaves them doing the same as victims sometimes do? Or, are we so enamored with celebrity that it blinds us to what conduct may say about one’s character? Or what if our collective moral compass is so out of whack that we don’t even see this kind of unacceptable and even criminal behavior to be unacceptable or even criminal anymore? The reality is that we are all integrated human beings. While we may not choose to live lives of integrity, our tendency to compartmentalize the conduct of ourselves and others from character should cause us great concern. Once again, this is a current cultural event that’s about much more than the issue of domestic abuse. It’s about who we are. It’s about who we choose to be. Certainly, followers of Christ who have been shown amazing grace must turn around and do the same. But that’s no excuse for blindness. While we must be generous with forgiveness, we also have to hold and be held accountable. Actions have consequences. If a malignant tumor is misdiagnosed as benign, the malignancy will continue to advance and do damage unchecked. This story reminds us of our need to talk about these things with our kids. ← Youth Workers. . . An Ad You Can Use. . .